This issue is broken into three broad sections. The first, Focus on: “What do we teach?” includes articles from leading academics and educators. Hanan Alexander of Haifa University opens the journal with his thoughts on how the systematic exploration of the process involved in deciding what to teach will affect educational practice. Following that is a discussion of the applicability of developmental theories to curriculum construction. In Some Misunderstandings of Piaget and the Curriculum, David Elkind, Professor of Child Development at Tufts University argues that Piaget never intended to provide a curriculum to be taught, but his theories provide excellent guidelines for curriculum development and evaluation. Based on the work of Piaget and others, Stanley Peerless of the Lookstein Center discusses developmental stages and their relevance to the Jewish Studies curriculum. Finally, in a presentation on Social-Emotional education, Jonathan Cohen of Teachers College, Columbia University introduces us to some of the core concepts of Social-Emotional learning. In a companion piece, Chana Zweiter, founding director of the Rosh Pina Mainstreaming Network, describes the application of the Kaleidoscope method, an approach that focuses on how to create a caring learning environment in school. 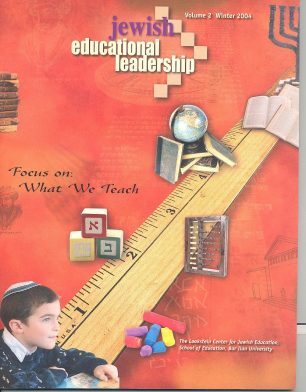 The Applications section includes a compendium of curricula developed and implemented in various school settings, as well as an article describing an actual curriculum development project being implemented in a number of Jewish day schools under the direction of Eli Kohn of the Lookstein Center. Finally, in an article that we hope will encourage you to consider examining your own work in education, Eric Golombeck presents “action research” about how one Jewish school modified its prayer services to better meet the needs of its student body. In the last section we return to our regular features. We get a discussion started between Jewish educators about positions taken by Professors ED Hirsch and Howard Gardner on whether literacy or skills should be the core of our curricular focus. In our review of educational materials, Tsipi Keller of the Herzog College presents a series of guides to Tanakh. Levi Cooper examines classic sources that warn of “the revenge of the letters and vowels.” Finally, Jeffrey Woolf offers insights on Jewish educational leadership. To read the editor’s complete introduction, click here.